Hind shoe stepped on by opposite hind. The last two weeks of July I saw more lost shoes than I have ever seen in my entire career in the same amount of time, outside of working an eventing horse trials. I put back on four shoes for my own clients and seven for other farriers in the span of only one week. Lost shoes are despised by horse owners and farriers alike, so what are some of the reasons for lost shoes, and how can we prevent them? Shoe nearly off from stomping flies. Shoes come off for a variety of reasons, though a majority of the time it is due to the horse stepping on the edge of the shoe. When a shoe is stepped off, it is generally a hind foot stepping on a front shoe, and occasionally a front or hind stepping to the side on its pair. As a horse moves, the hind feet land in nearly the same place as the fronts were or for some horses even further forward. It only takes a small misstep from the horse to catch his shoe enough to pull it off. A misstep can be caused by rough terrain, slick or deep mud, or even a rider losing their balance. 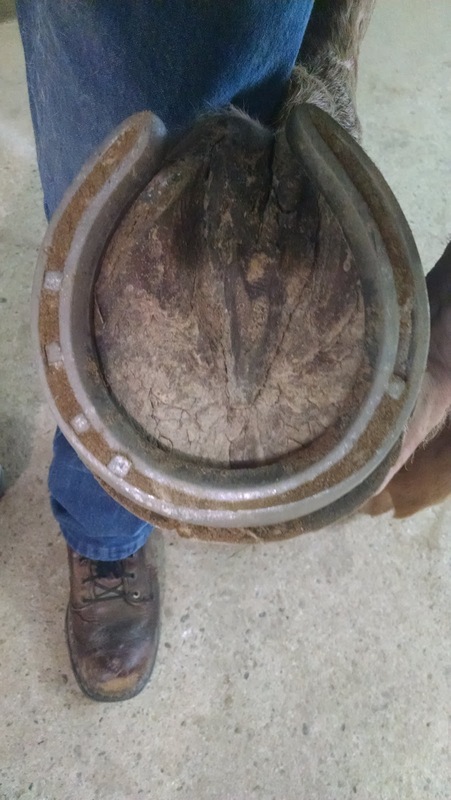 Shoes can also be stepped off more easily due to poor quality hoof wall, white line disease, poor nailing, the horse being overdue for a trim or fitting a shoe too full. Some shoes are also pulled easier, a horse wearing egg bar shoes for instance should not be turned out in a muddy field because they are likely to pull a shoe. Because of a horse’s conformation, some are also more likely to overreach and pull off a shoe or injure themselves. They can also be pulled by a horse pawing at a wire fence, stomping flies or catching it on an object such as inside a trailer or stall. In the case of the two weeks recently, it was a combination of lots of rain that softened hooves and then dry spells with hard ground and bad flies. Horse owners can help prevent lost shoes as well, properly fitting bell boots are certainly a good solution for horses that tend to overreach, as well as a great preventive measure for horses with jobs like cross-country. 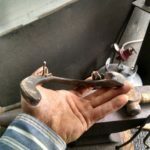 Keeping horses on a regular schedule with a quality farrier will keep the horse’s hooves in better condition which will help to reduce the number of lost shoes. Regular maintenance around the farm can also help, sagging wire fences, bailing twine left in the field and excessive mud can all contribute to the issue of losing shoes. 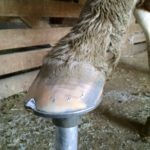 Nutrition, which plays a major role in the health and quality of the hoof, also has an impact on the number of lost shoes. 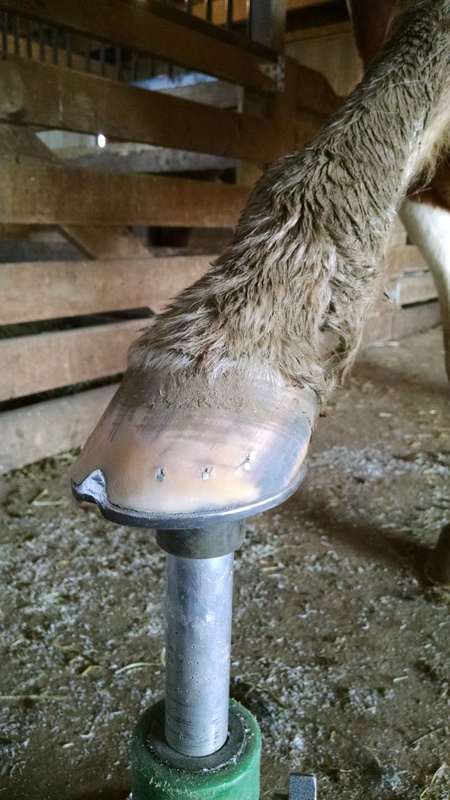 The healthier the hoof the more likely shoes are to stay on. At Dixie’s Farrier Service we do our best to provide the highest quality work possible as well as caring for you and your horse. 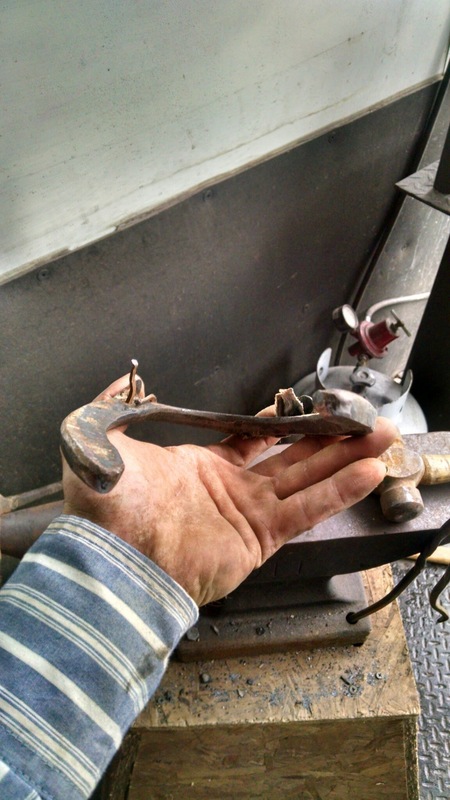 A farrier’s work should certainly not be judged based on how long the shoes stay on (a future post will be about how to tell the difference between quality work and work that is not). We stand behind our work and will get a lost shoe back on as quickly as possible. Anytime you have an issue with a lost shoe, contact your farrier as soon as possible so they can hopefully get out to you quickly.